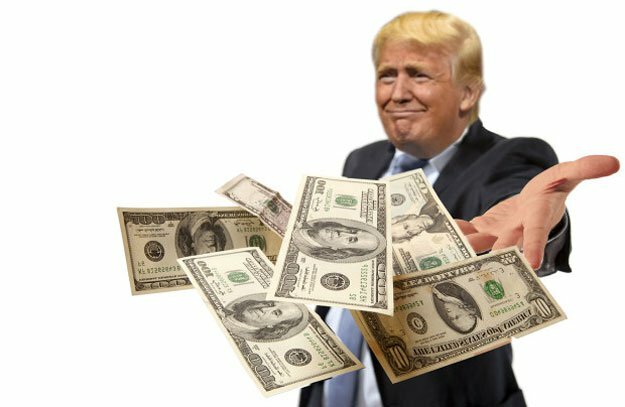 Trump gets paid $529,000 yearly and is giving the money away. 14 Mar Trump gets paid $529,000 yearly and is giving the money away. Wouldn’t it be nice to give away your salary cause you were so rich you didn’t need it? Billionaire Businessman and now President of US, Donald Trump said several times during his presidential campaign that he did not plan to take a salary. Today it was announced Donald Trump will donate his annual presidential salary of US$400,000 (A$529,000) to charity by year’s end. The strange part about the announcement was that he wants the media he often criticises to help him choose a worthwhile cause. “The president’s intention is to donate his salary at the end of the year,” White House press secretary Sean Spicer told reporters at his daily briefing. “He made a pledge to the American people. “He kindly asked that you all help determine where that goes,” he continued, a rather unusual statement from a White House that has made hostile confrontation with the media a near-daily occurrence. “The way that we can avoid scrutiny is to let the press corps determine where it should go,” Mr Spicer said with a hint of irony, perhaps in reference to past media scrutiny of Mr Trump’s donations and the management of his family foundation. Trump is not the only president to do this, in the past, Herbert Hoover and John F. Kennedy also donated their presidential salaries to charity.